Look what I received in the mail today!!!! 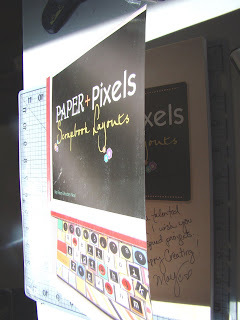 An autographed copy of "Paper + Pixels Scrapbook Layouts!" Can you peek in the inside cover and see May's signature? I have been wanting this book ever since it hit the shelves! Now I have it. I won this from May Flaum's blog. Can you tell by my post that I am a wee bit excited? Thank you so much May! I will be putting my current book, "The Story of Edgar Sawtelle" down for a little while! Which is currently the book from Oprah's Book Club. MMMMMMMMMMMMMM....I think I even have all of those ingredients up here!! Looks wonderful, can't wait to try myself! congratulions on winning the book , you sound soooo excited ! nice to know its gone to someone who is gonna love it sooo much ! Lucky! I'm gonna have to hit Amazon for a copy.